Stacy Teet, a mother of three and former Air Force intelligence analyst, has been described as a Curator of Awesome. She is a sought-after contributor to up-and-coming social media sites and is a brand ambassador and consultant to national brands. Keep reading to learn how Stacy stays on top of the changing world of social while managing her busy home life and clients. 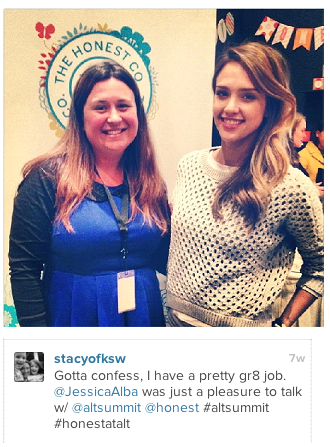 Jessica Alba of The Honest Co. and Stacy Teet at the Alt Design Summit. Teet started out as a blogger in 2008, “along with everyone else,” she joked. She wrote about parenting and family topics on her site Kids Stuff World. She soon discovered that her strengths lay in connecting and conversing on social media more than blogging. But she parlayed her blogging into consulting by playing to her strengths. Here’s how she did it. 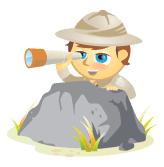 Teet has always loved checking out new platforms and tools. She is constantly keeping an eye out for the latest thing. In 2010, Pinterest was the latest thing, so she wrangled an invitation from one of her connections. She used her profile to catalog things moms would love—recipes, projects for kids, clothing, etc. She soon had over 65,000 followers. Then she had 125,000, and now boasts over a quarter of a million Pinterest followers. 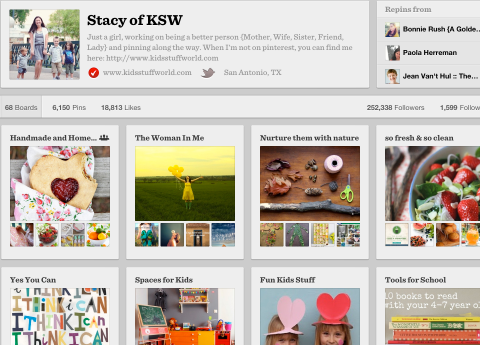 Stacy Teet has amassed over a quarter of a million Pinterest followers. Her rule of thumb is to give something new at least a 6-week trial, though she knows there is only so much she can add. “For everything you add, you are taking something else away,” she said. With Pinterest, she loved its visual nature, and she immediately saw its potential. By being an early adopter, she was able to take advantage of the site’s swelling popularity. By being strategic with her content, she was able to get noticed. For the past year, she has been a Pinterest consultant and brand ambassador for toy manufacturer Melissa & Doug and several other brands. Developers now seek her out, but she still discovers new platforms and tools by watching what the heavy-hitters are doing. She credits a lot of her success to being in the right place at the right time. However, by staying on top of things, “you can put yourself in the right place and time,” she said. When she was in the Air Force, Teet read a Daily Read File every morning to keep on top of the information she needed and get highlights of activity she was following. A self-described “information hoarder,” she has recreated that approach in her online world. “My goal is never to try to consume everything that people have created out there, but to try to stay on top of it as much as I can and as quickly as I can,” she said. She always wants to consume the most information in the fastest way possible, and for her that means visually. Her current go-tos are Pinterest and Flipboard. Teet loves Flipboard because it makes things visual that aren’t inherently visual, such as Twitter streams and RSS feeds. 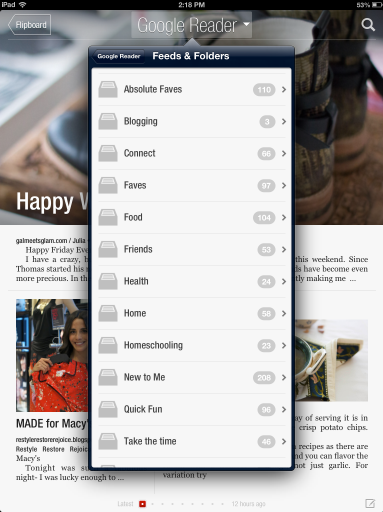 The mobile app gives a magazine-like feel to any content you feed into it. 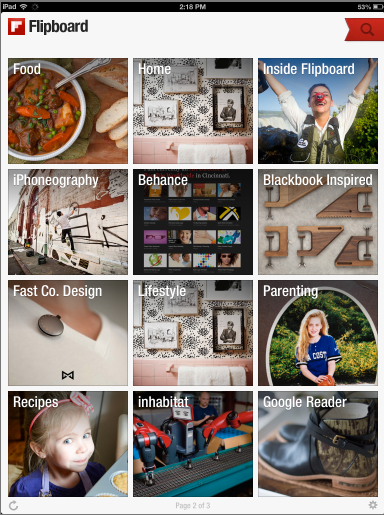 Teet uses Flipboard to quickly search her channels. Teet feeds blogs she follows on Google Reader into Flipboard. As she’s flipping through, she shares content to Twitter, Google+ or other sites, emails it to herself or a client or simply flags it to read later using Pocket. “The big thing is to get through it all, then figure out what you’re going to do with it,” she said. Teet is a big fan of tagging for later. Her Pinterest account, for example, has over 18,000 likes. “I flag and star a lot,” she said. “Maybe I come back to it and do something with it and maybe I don’t.” she said. In Google+ she has a circle called “My Eyes Only,” where she shares information she doesn’t want to lose. She spends about 15 minutes per week finding new people to follow, starting with someone who is sharing great content and then “going down the rabbit hole,” as she describes it. As a parent of three young children, Teet does not have regular hours that she can devote to her social media work. Instead she uses mobile technology and the dribs and drabs of time that become available to keep tuned in to what is going on. “Everything I do is mobile. I do more things on my iPhone and my iPad than I do on my computer,” said Teet. The only tasks she prefers to do at her desktop are posting articles to her blog and photo editing. Her iPhone has eight pages of apps that let her access accounts when she is in the carpool line to pick up her kids or at the Y after a workout when she has an hour of childcare left. 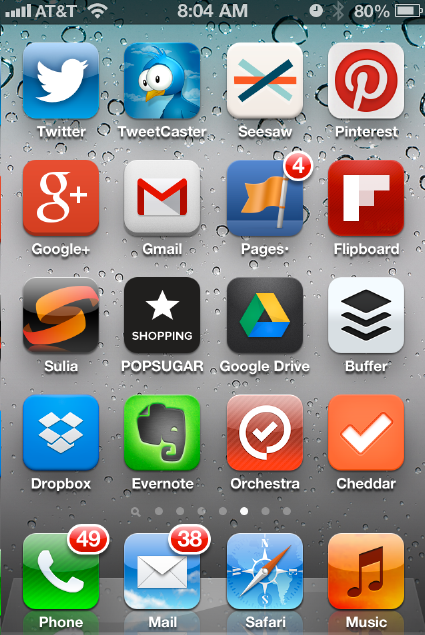 One of eight pages of apps on Stacy Teet’s iPhone. One benefit of her fragmented days is that she doesn’t often have to use Buffer or other tools for scheduling updates. She is careful not to overload her audience with too much at one time. How do you rock your social media world? What strengths do you draw on? Leave your comments and questions below.